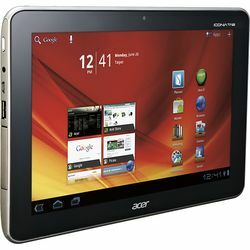 Amazon has the Acer Iconia Tab 10.1" Android Tablet Sale for $288.86 with Free Shipping. Lowest by around $60. This thin tablet features a large multitouch display with 16GB of internal storage. It also runs on Android 4.0 (Ice Cream Sandwich), updatable to Android 4.1 (Jelly Bean). It's rated for up to 8 hours of battery life. Great alternative for anyone who doesn't want to pay hundreds more for an iPad or anyone looking for a feature-packed 10" tablet under $200...a rarity these days. It's also an obvious choice if you already have other Android devices like an Android smartphone. Good user reviews at Amazon, Newegg and on the Acer site.